Check out this map showing the proposed road changes and the signalized intersection to be removed. As a part of the Yellowhead Trail strategic plan, the traffic signals at the Yellowhead Trail and 66 Street intersection will be removed. A concept planning study is currently underway (Fall 2018–Fall 2019) and will determine the changes required to the future roadway network in the project area. 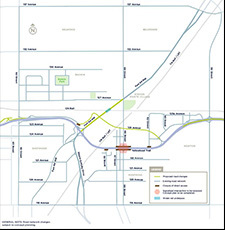 The project includes the widening of Fort Road to six lanes from Yellowhead Trail to 66 Street, with widening of the CN Rail underpass. The clearance at the CN Rail underpass will also be increased by lowering Fort Road. Concept plans have been developed for the widening of Fort Road and design is scheduled to begin in 2019.